Can We Save Them -- and at What Price? HAMMOND, Ore. -- The salmon of the Northwest are the stuff of legends. Pioneers talked of rivers so thick that they were tempted to cross on the backs of the fish. When Meriwether Lewis led his band of explorers through the Northwest in 1805, he marveled in his journal of "almost inconceivable" numbers of salmon. Our lives are intertwined with the salmon and its fate. Residents get their power, their food, their spiritual sustenance, their recreation and their identity from the fish, the rivers and the wild nature of this region of the United States. Yet today, there still is no sustainable plan for saving salmon, and the changing climate will put even more stress on remaining fish stocks. This will make getting salmon to Idaho's high-mountain habitat more critical than ever to the species' future. For NOAA biologist Laurie Weitkamp, the secret to saving the Columbia River salmon might reside in the fish's blood. By testing year-old salmon just before they head out to the Pacific, she can tell how well they are eating as they prepare for their journey. And salmon are in Nez Perce fisherman Eric Holt's blood: As a 10-year-old, he and his brother watched as tribal fishermen were beaten with clubs for asserting their treaty rights to fish on the Little Salmon River, and he watched his grandfather be led away by police in handcuffs. "You guys will know one day why I'm going to jail," his grandfather told him. Sea lions are just one more in a series of challenges to the survival of the Northwest's remarkably resilient salmon. The question is whether the region's imperiled species have the time to adapt before hostile river conditions, lost habitat, a gene pool diluted by hatchery fish and a changing climate make it impossible to survive. Dams such as the Grand Coulee in Washington and Idaho Power's Hells Canyon complex in Idaho blocked off nearly 2,000 miles of spawning habitat. Commercial fishing had depleted the salmon runs by the time the Bonneville Dam was built in 1938. Seven more dams were built, ending with the Lower Granite Dam near Lewiston in 1975. The river became a series of slow-moving reservoirs. So many juvenile salmon were killed trying to pass through those dams' hydroelectric turbines and the warmer, slower pools that by 1977 populations had slumped. Since 2005, Weitkamp, the NOAA fisheries biologist, has netted and studied the juvenile salmon in the estuary at the mouth of the Columbia River and in the Pacific, monitoring the health of these migratory fish that carry energy and nutrients from as far away as Kamchatka in Russia's Far East to high mountain meadows in Central Idaho. Cargo and cruise ships pass her research vessel entering and leaving the estuary, accentuating the Columbia River's role as an industrial artery for the Pacific Northwest. "It's really the exceptional fish that are making it back to survive, and we're trying to figure out why," Weitkamp said. They know that when the Pacific is cooler, when its upper waters are fed by upwelling of cold, nutrient-rich waters, Columbia salmon do better. When the ocean gets warmer, salmon productivity drops -- sometimes drastically. Part of this is due to tiny crustaceans called copepods, a fatty food source for many of the salmon's prey, such as herring. Their abundance in the colder ocean increases the productivity of the food base and ecosystem on which salmon and other fish rely, Weitkamp said. "I describe it like the difference between popcorn and hamburgers," Weitkamp said. "When there are hamburgers, you eat hamburgers. When not, you eat popcorn." Warmer waters bring predators that feed on juvenile salmon. Many biologists point to hake, a silver-gray fish similar to cod, as the main predator. But Weitkamp said research is inconclusive on which of the salmon's many predators, including endangered killer whales, have the most impact. But in 2014 and 2015, a "blob" of very warm water independent of the oscillation was seen in the northern Pacific. It had never been detected before. This blob was created when the 2013-2014 winter had none of the huge storms that usually mix the surface water down to 400 feet, said Bill Peterson, a NOAA fisheries oceanographer. "These have been the poorest ocean conditions I have seen in the 23 years I've done my work here," Peterson said. 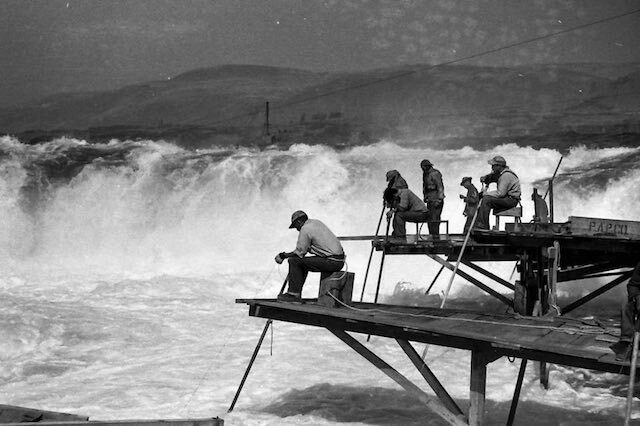 The region's Indian tribes watched helplessly as dams blocked off the rivers where salmon spawned and reservoirs behind them covered places such as Celilo Falls near The Dalles, Ore., where tribes had fished since time immemorial. Beginning in the 1960s, tribes fought for the rights retained in the 1855 treaty that transferred most of their land to the United States. In 1968, Richard Sohappy and 14 other Yakama fishermen chose to exercise their right to take fish at "all usual and accustomed places," as the treaty read. A federal judge ruled in their favor in a landmark decision. The Nez Perce staged "fish-ins" at the traditional fishing site where Rapid River enters the Little Salmon north of Riggins. In 1980, an Idaho State Patrol SWAT team arrested 36 Nez Perce fishermen. "You guys don't cry," he said. "You guys will know one day why I'm going to jail." Holt sees his elders' faith and sacrifice in terms of the life of the salmon, which spawns in the river after its long migration and then dies. "They give themselves to us in a way no other animal does," Holt said. "They're the only animal that doesn't see their children prosper." The U.S. Army Corps of Engineers and NOAA Fisheries took action to address the deaths at the dams. They developed a bypass system that screened the fish away from the hydroelectric turbines. They trapped fished and put them in trucks and specially designed barges and released them in the estuary below the dams. But state and tribal biologists' research showed that fish that are carried past the dams through the bypass systems do not survive as well as those that go over the dams' spillways. The research has not explained why. Repeated court orders required federal officials to improve the dams, and they developed a "four H" strategy: hydro improvements, habitat restoration, hatchery reform and harvest limits. Forced by a federal judge to spill more water (and fish) over the spillways to avoid the turbines and bypass systems, federal dam managers developed systems to make the trip easier on the salmon. Glass, the salmon outfitter who lives in Troutdale, Ore., has a front-row seat to watch the salmon's success or failure. Glass joined his father, Jack, in a guiding business that takes clients fishing for salmon and other fish in the Columbia's estuary and tributaries in the spring and the fall. In the winter he fishes for steelhead in the Sandy River. In the summer he heads to the Pacific, where he takes anglers miles out to fish for tuna. Salmon show up sold as food, but also in economic activity that includes sales and employment in boat-making, fishing equipment, outfitting, motel rentals, groceries and gas. It includes research, hatcheries and equipment, such as the tiny electronic fish tags manufactured in Boise by Biomark. The power council's economists acknowledged a recovered salmon population would have substantial benefits but said Reading's study overestimated those benefits. When poor returns limited this year's fishing season for spring-summer chinook salmon, it was felt from Orofino and Kamiah on the Clearwater River to Riggins, Salmon, Challis and Stanley on the Salmon River. "It hurt our business throughout the fall and winter with steelhead," said Kelly Thompson, who owns Riverview Motel in Riggins. "With the chinook fishermen, normally the end of May through June everyone in town (is) slammed. ... It won't happen this year." "When the salmon and steelhead smolts come through, the walleye and bass stomachs are full of salmon," Knotts said. "These are sea lions," Glass said, "these are not river lions." That includes devices such as "removable spillway weirs" that allow fish to go over the dams more naturally at lower flows. She helped convince managers to discontinue barging smolts through the dams on the Columbia and to reduce barging on the Snake. For fish that migrate in spring, what the managers call "smart spill'' helps 96-98 percent of salmon survive each dam. "Our fish travel times are close to or equal to what they were before the dams," said Bodi. State and tribal biologists acknowledge the progress but note that it came under pressure from federal judges. Salmon advocates want to see more water spilled at the dams to aid salmon, especially in low-water years like 2015, when most of this year's salmon migrated to the sea. "We know from the years of nature's bounty that more spill means more fish," said Ed Bowles, Oregon Fish and Wildlife Fish Division chief. Earlier this month a bipartisan group of Oregon and Washington members of Congress introduced a bill that would effectively overturn Simon's decision through 2021, Annette Cary of the TriCities Herald reported. Among the sponsors are Reps. Cathy McMorris Rodgers, R-Wash., Kurt Schrader, D-Ore and Greg Walden, R-Ore. Working with farmers and even buying water in Washington and Oregon, officials got control of 400,000 acre-feet of water. That's about as much water as what's held in Boise's Lucky Peak Reservoir, and it goes to keep rivers flowing through important habitat. Under Simon's order, over the next four years federal dam managers and fisheries officials will study everything they do. They will have to show that the progress they have made meets the law. "A fair question is, are those investments enough to recover species and are those improvements enough to counterbalance the estimate of what might happen with climate change over the next 30 or 40 years?" said Ritchie Graves, NOAA Fisheries chief for the Columbia River hydro program.